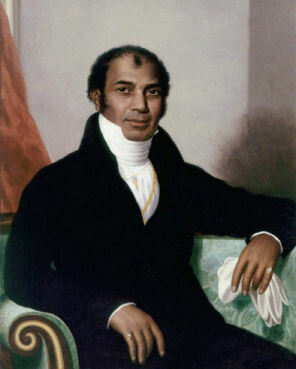 Sake Deen Mahomed, who was born in Patna India, was a notable figure in the development of Brighton’s 19th century bathing industry. 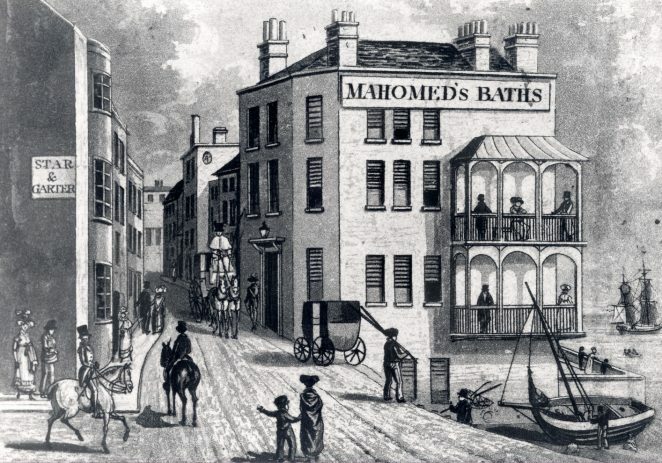 In the early 1800s, Mahomed established a ‘vapour bathhouse’ on the site that is now the Queen’s Hotel Kings Road. 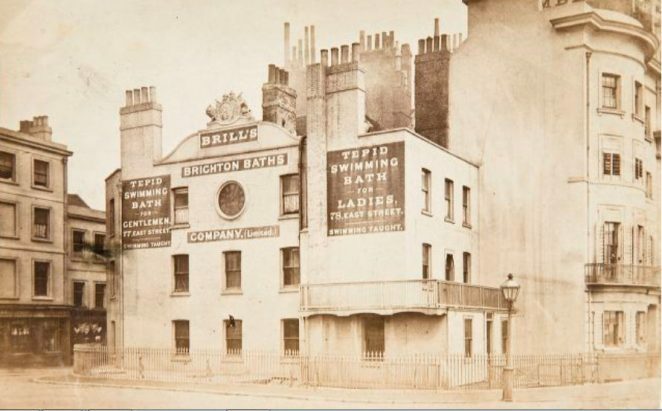 Building on Brighton’s existing penchant for water therapies, his baths used steam and exotic Indian oils. Sake Deen Mahomed called himself a ‘shampooing surgeon’ and offered his clients a massage with Indian oils. The ‘shampooing’ service was performed by an attendant through flannel sleeves, in a tent-like cover. ‘Shampooing’ became popular after several successful cures, especially of rheumatic problems, and the walls of Mahomed’s bath house were hung with the discarded crutches of cured patients. ‘The Indian Medicated Vapour Bath’ according to Mahomed was ‘a cure to many diseases and giving full relief when every thing fails; particularly rheumatic and paralytic, gout, stiff joints, old sprains, lame legs, aches and pains in the joints’. The business was an immediate success and Mahomed became known as “Dr. Brighton”. His methods were considered so efficacious that hospitals referred patients to him, and he was appointed as ‘shampooing surgeon’ to George IV. The King was so convinced of the benefit of Mahomed’s treatments that a vapour bath was installed in the Royal Pavilion. Mahomed’s use of the word ‘shampooing’ was derived from the Hindi word ‘champi’ which described a head massage. It was not until later that the meaning of the word shifted from the sense of massage, to the idea of applying products to clean the hair. Having patronage from the King assisted Sake Deen Mahomed in gaining a reputation in Brighton and, attracting an important clientele that ensured prosperity not only for himself, but for others involved in the bathing industry. When Mahomed retired the business passed to William Knight and later to Charles Brill. 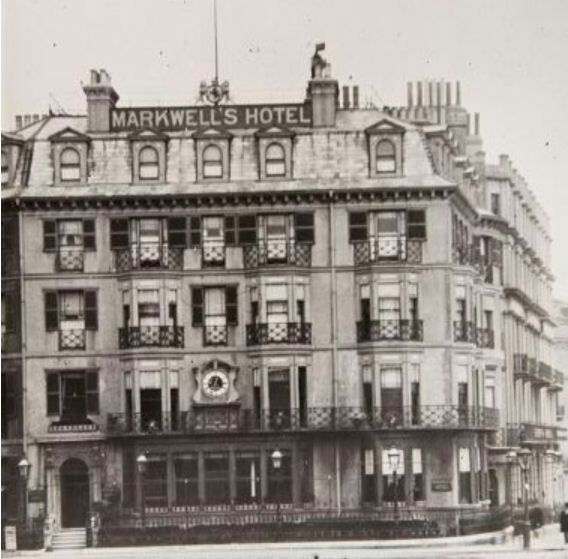 When the new Brills Baths were erected in Pool Valley, the old building was demolished and replaced in 1870 by Markwell’s Royal Hotel. 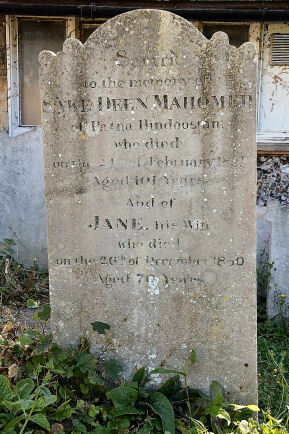 Sake Deen Mahomed died in 1851 and was buried at St. Nicholas’ Church Brighton. Mahomed’s Baths; now The Queens Hotel, Kings Road. I see there is a Henry Mohamed and family listed in St James’ Square, Westminster in the 1851 Census. It states Henry was 34, a Baths Proprietor, born Brighton. Was this another son of Sake Deen and Jane, and were there any other children who survived to adulthood and had families?